Georgi Kyorlenski is possibly the only representative of a crossbreed between two rather large groups—Bulgarian archaeologists and U.S.-trained Andeanists. He received a B.A. in Anthropology and History from Beloit College and an M.A. in Museum Anthropology from Columbia University. Georgi is primarily interested in Inca imperial control through nonviolent means and nonhuman interactions. He is academically invested in the art of institutional manipulation, propaganda, and the power of the collective imagination. His M.A. thesis proposed a new model of an on-site openair archaeological museum, which reunites objects, architecture, and site into a more comprehensive tool for interpreting and experiencing the past than the current heterotopic state of archaeological collections. 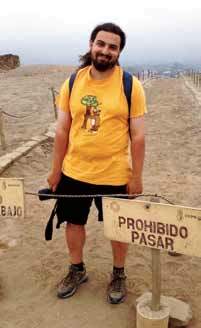 Georgi has previously excavated in Peru and Bulgaria and will work with Dr. Stella Nair at University of California Los Angeles. He is an avid Manchester United fan, a mediocre bassist, and a casual fiction writer.